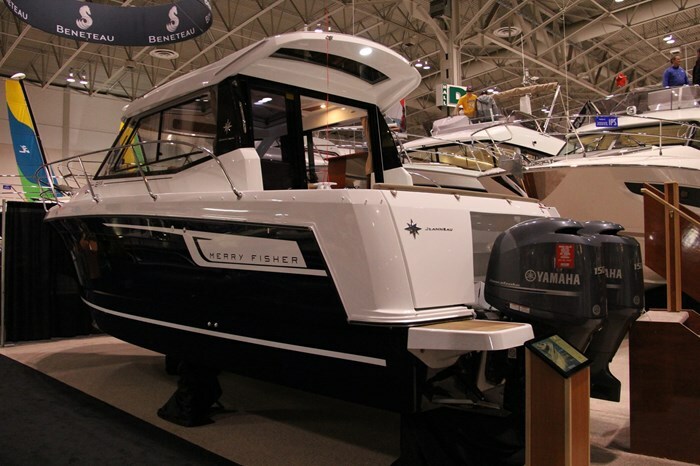 The Merry Fisher brand of powerboats is part of the Jeanneau family of pleasure boats which includes several brand names of centre consoles, dual consoles, walkaround cuddy cabins, mid-cabin express cruisers, sedan and flybridge cruisers, plus sailboats up to 65-feet. Henri Jeanneau built his first wooden powerboat in Les Herbiers, France in 1957, switched to fibreglass in 1961, and in 1963, his company joined Benjamin Bénéteau’s family boatbuilding company which was founded in 1884, also in France. Today, the Bénéteau Group includes world recognized brands of production and custom cruising sailboats up to 80-feet. Powerboat brands include Montecarlo, Prestige up to 70-feet, CNB yachts starting at about 75-feet, plus the recently acquired Rec Boat Holdings brands of Cadillac, Michigan including Wellcraft, Scarab, Glastron, and Four Winns. The Bénéteau Group also builds commercial work and passenger vessels plus owns other unrelated companies. This is one huge, diverse, and worldwide organization. 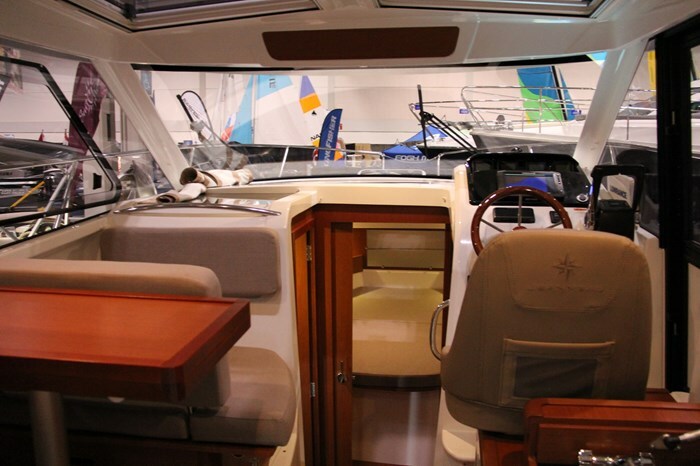 The Merry Fisher division of Jeanneau, for 2015, offers seven models in four sizes of outboard powered hardtop sedan cuddy cabins and cruisers plus the more fishing/cruising oriented Marlin sub-series from the 605 model to the 855 model which is the subject of this review. The model number designation is an indicator of the boat’s length overall in meters. Thus the smallest 605 Is just short of 6-meters or eighteen feet, eleven inches length overall and this largest 855 is 8.72 meters or 28 feet, 7 inches. 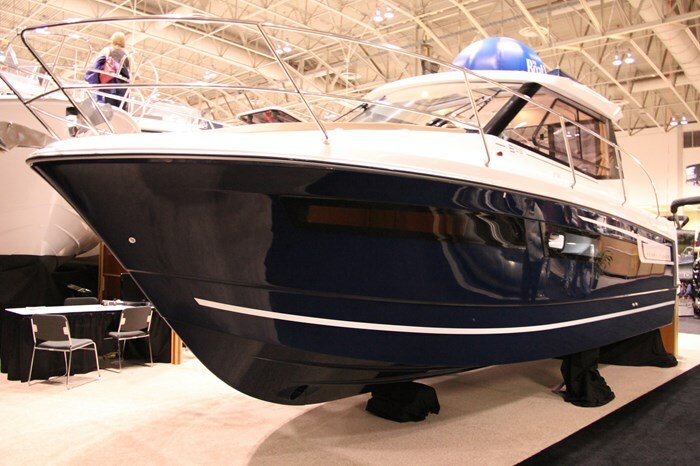 The outward appearance and several of the features of the Merry Fisher 855 hardtop sedan mid-cabin cruiser are noticeably different from most North American built cruisers of this size, except perhaps some from the pacific northwest of this continent. 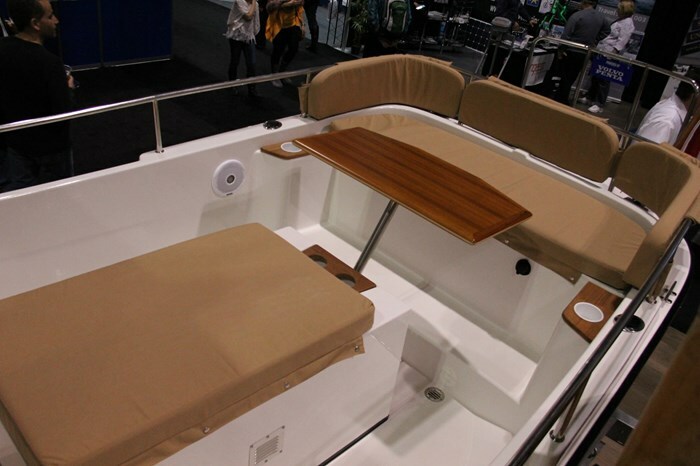 These features are particularly suited to those wanting a solid full cabin enclosure in this size of cruiser for all-weather and sun protection without requiring any canvas to provide that protection. Riding on a roomy nine foot, nine inch beam, the hardtop extends from the relatively high windshield aft to include a significant eyebrow overhang above the forward portion of the cockpit and with a translucent panel in this overhang to provide natural lighting. 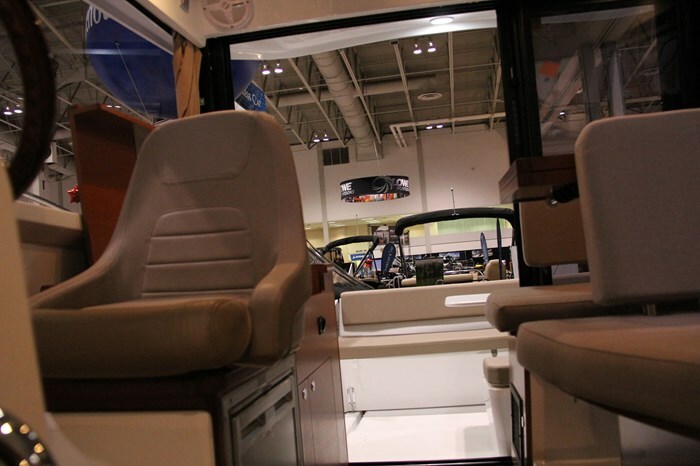 Above the helm and passenger seating are a pair of quite large sliding, opening glass hatches, again for natural lighting plus ventilation within the salon/cabin. Unusual in a boat of this size is an additional sliding door on the starboard cabin side next to the helm for easy and quick access to the side deck. Along with this door, about half of the tall port side window slides open to provide lots of cross-ventilation. The sedan bulkhead is all-glass with a double-wide sliding door. All of this opening glass makes the salon/cabin naturally bright, cheery, and well ventilated. 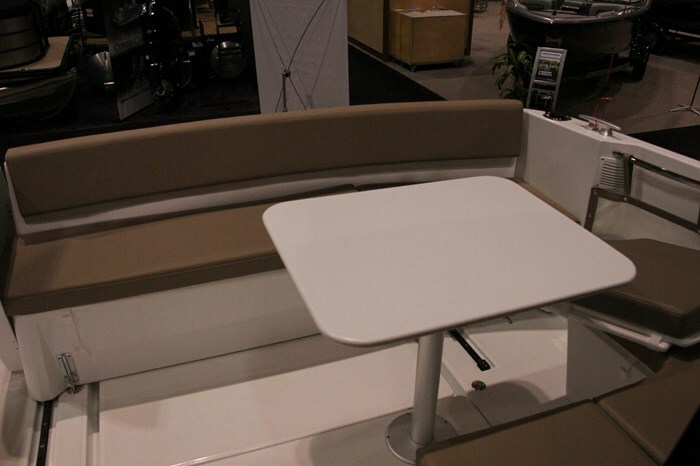 To port when entering the salon/cabin from the cockpit is a four-seater, booth style dinette. 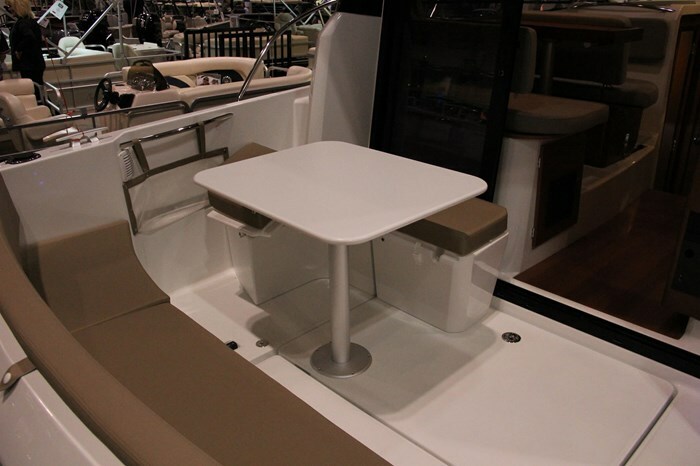 The entire forward seat base of this dinette slides aft to become a double-wide, forward-facing passenger bench seat opposite the single helm bucket seat. 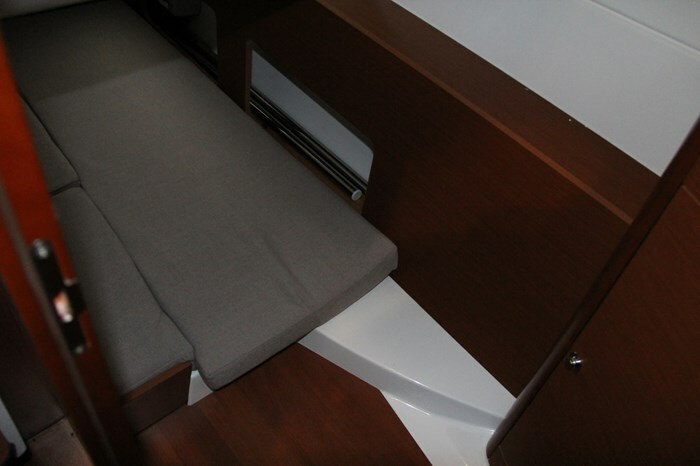 Aft of this helm seat is a galley unit with countertop, sink with pressure water, and gas stove. At the helm, hydraulic steering is standard as are dual windshield wipers with washers plus single or twin outboard instrumentation. 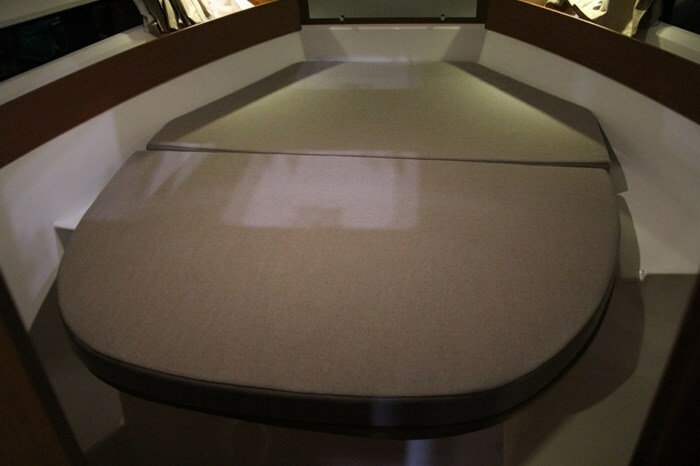 Below and straight ahead, the forward cabin offers a pedestal-style double berth, opening deck hatch, hull and deck fixed windows, plus a hanging locker plus storage. To port, a solid door leads to a mid-cabin with double berth, hanging locker, opening portlight, plus fixed deck windows. To starboard, another solid door enters to a head compartment with vanity, storage, sink, wand shower/faucet, plus a manual marine head with holding tank. 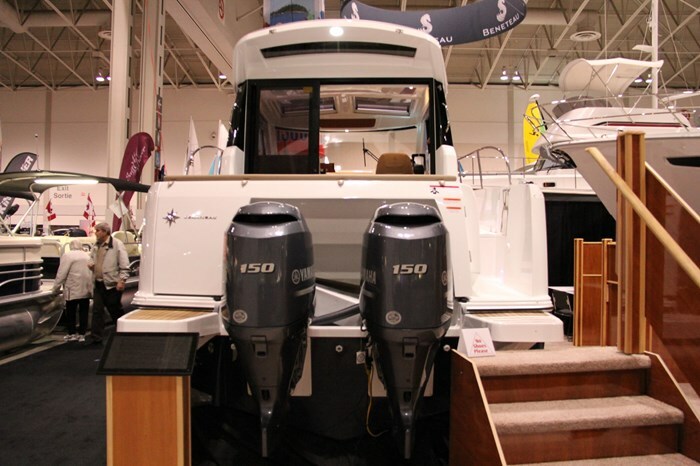 Other notable standard features include an anchor locker and roller, aft cockpit sliding bench seat, transom gate with two half swim platforms plus boarding ladder. Power for the Merry Fisher 855 is your choice of a maximum recommended single 300 horsepower outboard or twin 150 horsepower outboards. There are several individual factory options available and a couple of option packages. The very cruising-desirable Premiere Package includes an anchor windlass, trim tabs, cockpit bench cushions, cockpit shower, LED cockpit lighting, electric galley refrigerator, plus the convertibility of the salon dinette into a double berth. The Preference Package also includes cruising niceties such as a bow thruster, shore power with battery charger, and a hot water heater. Other notable options include a Lowrance Combo HDS-9 touchscreen GPS/plotter, Lowrance P79 depth sounder, foredeck sunpad, cockpit table plus sunlounge, cockpit awning and/or enclosure, bow ladder, cabin air conditioning/heating, galley microwave, wood flooring overlay inside and out, and cabin curtains. The Merry Fisher 855 may look different in a European way that you may not be used to but it has many, many desirable features that are so appropriate for our Canadian cruising weather and water and is certainly worth a long, hard look.